Published: Sept. 25, 2016 at 02:35 p.m. Published: Aug. 26, 2016 at 09:16 p.m.
Washington Redskins cornerback Greg Toler recovers Buffalo Bills fumble at the Bills 40-yard line. 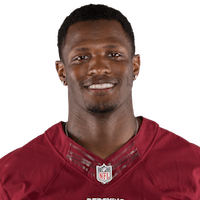 Published: Aug. 19, 2016 at 08:57 p.m.
New York Jets QB Geno Smith intercepted by Washington Redskins safety Will Blackmon. Published: Dec. 7, 2015 at 10:59 p.m.